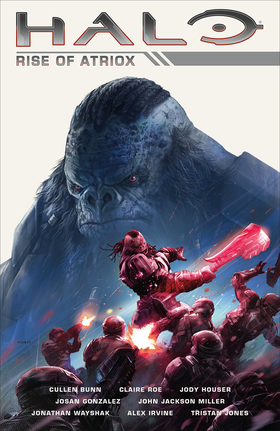 Halo: Rise of Atriox is a comic book anthology produced by Dark Horse Comics. A tie-in to the Halo Wars 2 video game, Rise of Atriox is a five-chapter mini-series that delves into the past of the Jiralhanae warlord Atriox, exploring his rise from Covenant soldier to ruthless Chieftain of the Banished faction. Issue #1 cover art by Aleksi Briclot. Issue #2 cover art by Aleksi Briclot. Issue #3 cover art by Aleksi Briclot. Issue #4 cover art by Aleksi Briclot. Issue #5 cover art by Aleksi Briclot.